﻿ HuntingNut » Forums » Hunting » Big Game Hunting » My boys first Deer! Does it OLD SCHOOL! Posted: Thu Sep 26, 2013 8:58 pm Post subject: My boys first Deer! Does it OLD SCHOOL! I had a spare muzzleloader, a Hawkin that is a tack driver. While heavy, I think they are easier to get sighted in on a target, and mechanically they are simple to use and teach the fundamentals. Over the summer we've been shooting it a ton. I had a life size paper archery target we'd set up and let him poke holes through it at different ranges. Everything looked great. I even had him practice using different rests... rocks, trees, steadysticks,, you name it! Opening morning found us at 9000ft and we quickly found a buck 60 yards away patiently watching us. My boy started to get set up but buck fever kicked in and he kept fumbling the cap. He kept trying to get the tiny thing on via the capper I let him use but he was too jittery and the buck finally spooked and ran off. We circled around but never saw him again. The rest of the morning we found quite a few does, but nothing with antlers. We came home for lunch and he hit up a couple school classes while I prepped gear for the evenings hunt and incoming storm. Snow, sleet, rain and otherwise miserable weather was the forecast so I readied the rain gear. We headed back up the mountain in the mid-afternoon and it truly got miserable. Wind and cold rain were down pouring. I taught my boy the basics of wet weather smokepole hunting so he was cautious about getting water near the breech. As we moved higher up the mountain the rain turned to sleet, then finally into snow. Still higher we went and the wind kept increasing as did the snowfall. I wondered if everything wouldn't just be hunkered down in deep timber. As we got up near the 9000ft mark again, I spotted a buck 40 yards off the side of the road! It was nibbling on a sapling or something and quite unconcerned with our being there. I got my boy ready, calmed him down and got his gun capped and locked. I told him take 4 steps forward and use the tree there as a rest, then blast the deer. I moved 10 yards up the trail with my gun ready as a backup. I expected a quick shot but nothing... nothing... more nothing. I then noticed there wasn't just that buck, but around 8 just below us. They finally started to hurry off and I told my boy you better hurry and get a shot off, they aren't sticking around much longer. Finally the buck he was aiming on bolted and ran off, much to my boys disappointment. I asked him why he didn't shoot, he said "I couldn't see it", I said you can see it just fine from here, all you needed to do is use the tree there as a rest like we practiced. He slapped his forehead and said he forgot to use the tree, tried to kneel down to get steady but was then too low to see the body. Doh! It was such a great presentation, buck fever struck again! We hunted around for another hour in that nasty blizzard that hit the high country wed but everything was pretty much deep in cover. Cold, wet, hungry and I'm sure "frustrated" for him, we decided to call it a day and come down. Once we got out of what we call the "deer country" he started to put away his gear and I stopped him, telling him keep ready, you never know when a deer will show up. About 300 yards down the trail sure enough, a doe walked across. We moved down another 500 yards when I was shocked to see a buck standing in a small clearing 60 yards away. I point him out to my boy and tell him you gotta be quick and shoot from here. My boy scrambles to get a cap back on the gun, but he got'er capped, locked and loaded. He had a heck of a time trying to keep the long heavy barrel raised in the gusty wind but after a moment he settled down and I heard the set trigger click. Here we go!!! I was downright giddy watching this come together for him. The buck was getting really nervous and just about to bolt when I heard the thunder of the ole Hawkin over the gusting wind. Oddly I didn't hear the impact but I clearly saw the bucks reaction, knew it was a great hit and it bolted off on a short death run. I congratulated my boy on his first ever deer kill, and helped him get the gun reloaded (he had speedloaders but was so shaky he needed help). He was all smiles and excited to see what came next. It was a simple tracking job, we found it not far away and the buck was dead. I knew it wasn't a big deer, but I was pretty shocked and greatly amused to see on its small 2x2 frame, small crab claw cheaters! It was actually a 4x3. I kidded him about his first deer being a 4pt! He was so happy it all came together. We had about 15 minutes of light left, snow was still coming down hard and all I had was my crappy cell phone camera but I did get a couple pictures. If the story ended here, it would still be a great fantastic experience for the both of us ... but in reality, it was better. At the bark of the Hawkin when he shot, an unseen huge bodied buck jumped out of a bush off to the side of his buck and ran across in front of us stopping behind a big pine. I think that buck hadn't seen us and was confused about the source of the shot. I scrambled and got my gun out of its case and got it primed, then moved over to the other side of the tree it ran behind. The buck came busting out in a rush at 30 yards and ran right up the trail my boys buck was on. It took a big leap over a log just as I fired and it dropped like a stone. Holy crap! I was pretty rattled actually. All the emotion of watching my boy get his first buck, to this quick follow up buck for me! Two deer down within literally a minute of each other, within 40 yards of each other. We drug'em for a side by side picture. What a crazy day... ended fantastically and I couldn't be prouder of my boy getting his first deer... with a old school Hawkin Muzzleloader in a blizzard after one cold miserable day. Posted: Thu Sep 26, 2013 11:32 pm Post subject: Re: My boys first Deer! Does it OLD SCHOOL! Awesome news mate. That's what hunting is all about mate...the excitement, the desolation at not getting the shot, followed by the elation of seeing more deer and pulling off a great shot for his first ever deer...then you pulling off a great unexpected shot to double the bag. What more could you ask for mate. Let your young fella know that he has the respect of not only Dad, but all of Dad's extended family on The Nut...we are all proud of his achievement mate. Posted: Thu Sep 26, 2013 11:41 pm Post subject: Re: My boys first Deer! Does it OLD SCHOOL! WAAA.. lookit that proud young fella. Posted: Thu Sep 26, 2013 11:43 pm Post subject: Re: My boys first Deer! Does it OLD SCHOOL! PARTY/BBQ AT DALLAN'S PLACE GUYS. Posted: Thu Sep 26, 2013 11:57 pm Post subject: Re: My boys first Deer! Does it OLD SCHOOL! proud of you both and pleased to be able to share the moment with you. a rack for the bedroom wall, rug for the floor and steak for the pan...you fellas have done great. Posted: Fri Sep 27, 2013 12:47 am Post subject: Re: My boys first Deer! Does it OLD SCHOOL! Something to remember and tell your grand-grand-children. Your son at age 12 already did something I've never done. I too have a Hawkin but I've never hunted with it. I've been thinking lots of times of trying it on roedeer... well you made me think of blackpowder again, it sure is a challenge. Posted: Fri Sep 27, 2013 2:14 am Post subject: Re: My boys first Deer! Does it OLD SCHOOL! 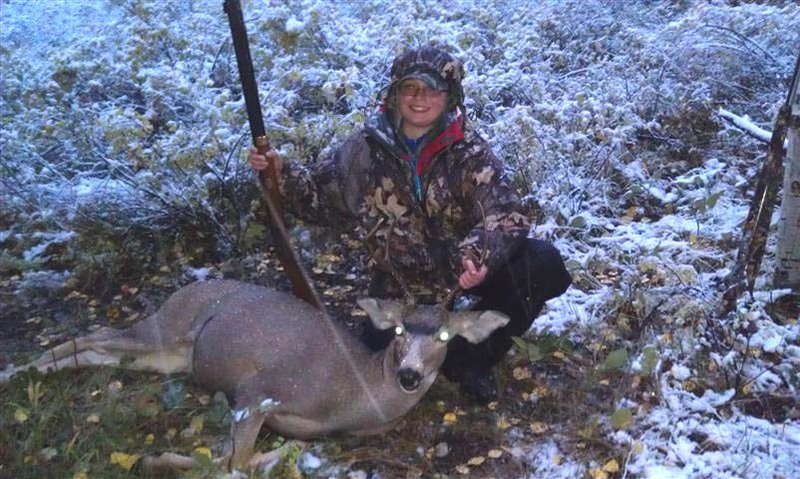 Posted: Fri Sep 27, 2013 6:32 am Post subject: Re: My boys first Deer! Does it OLD SCHOOL! That'll never happen again!! Way to go!! Junior Dallan has nerves of steal!! You got the weather all right, this Saturday the season starts here and we're expecting tons of rain and two cold fronts bashing into each other on Sunday. I think I'll sit at home and wait this one out. I've hunted in the rain every year and it's miserable sometimes you never dry out. They said the rain is expected to be measured in inches this time instead of fractions. 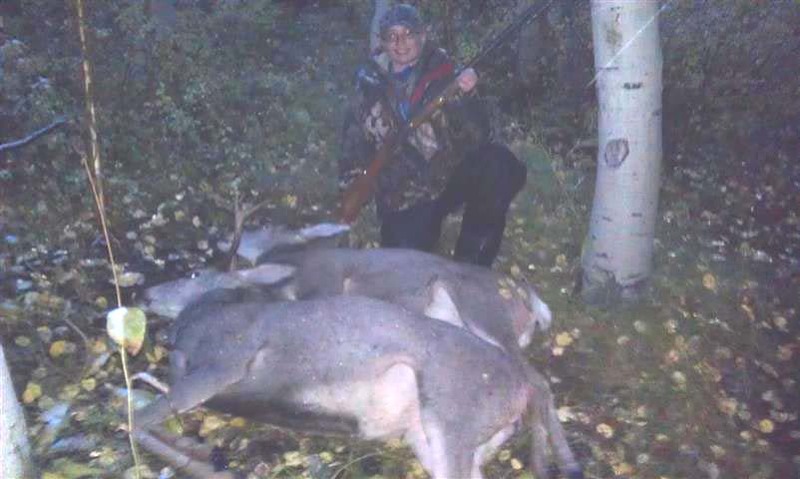 I know of 2 people lately that got bow hunted elk and real monsters, but from out of state. Both of them from New Mexico. I know that one was boned out to over 300lbs of meat. Thanks for the great story Dallan, I'm gettin stoked. Posted: Fri Sep 27, 2013 9:42 am Post subject: Re: My boys first Deer! Does it OLD SCHOOL! Mr Dallan makes us Dads all proud. Mine was with my oldest son and his .30-30 Winchester and a forked Blacktail. Hummm...Back strap and eggs for breakfast. Is that a TC Hawken I spy? .50 cal? I got one of those. Posted: Fri Sep 27, 2013 10:44 am Post subject: Re: My boys first Deer! Does it OLD SCHOOL! Great hunt, great story, and a great Dad. Congrats to the both of you. Posted: Fri Sep 27, 2013 11:02 am Post subject: Re: My boys first Deer! Does it OLD SCHOOL! Thanks everyone, its pretty cool to see it come together for him. When I was younger we had to be 16 to hunt big game... hes a lucky fart they changed the rule to 12 + passing hunters safety. Sharp eyes! Yep, my dad bought it in 1976 and never could hit anything with it. He gave it to me in the mid 1980's and I shot a fork horned muley buck and was hooked. Shot 5 or so more deer with it before I decided the barrel twist was lousy, ordered a quality Green Mt Barrel kit with a faster 1/28" twist and its been shooting clover leaf's ever since. Its killed a heck of alot of deer over the years. Anyway my boy drew a 2-doe antelope tag starting in a week... so he gets to potentially shoot 2 of those things. We're going to be full up on meat this year if all tags get filled. Posted: Fri Sep 27, 2013 11:26 am Post subject: Re: My boys first Deer! Does it OLD SCHOOL! Posted: Fri Sep 27, 2013 11:38 am Post subject: Re: My boys first Deer! Does it OLD SCHOOL! Congrats to the both of you on your harvest. What are you using for loads for that smoke pole? Got my last spike using a patched round ball and 90 grains of FFG. Posted: Fri Sep 27, 2013 12:44 pm Post subject: Re: My boys first Deer! Does it OLD SCHOOL! 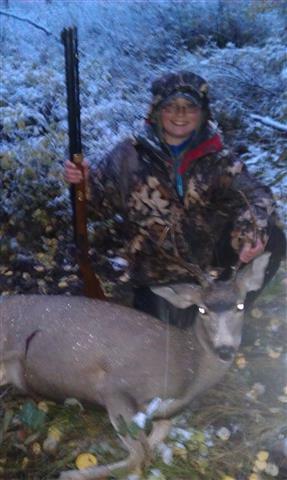 Congratulations Dallan, they are both dandy bucks and your son should be quite proud of his first deer. I can't wait till my boy is old enough, he is 6 now. My daughter is 12 and I need to get her hunter safety course. She is not sure that hunting is her thing yet but I figure I will let her give it a go and decide then. Still need to invest in a rifle for her in time but for now she is going to using the old 30-30. Anyhow I am glad to see you both had a good day and got some fine deer.